Jump On Board the Book Launch Express! 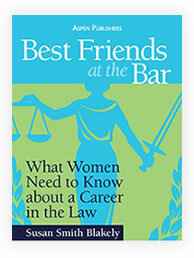 As I might have mentioned—-at least a few times lately!—-the Book Launch Event for my new book, Best Friends at the Bar: The New Balance for Today’s Woman Lawyer (Wolters Kluwer Law & Business, July 2012) is coming up fast. The date is September 27th, and the venue is Georgetown Law from 6 to 8 PM. 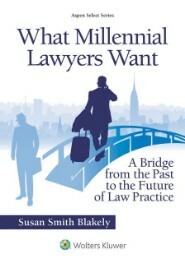 The celebration of the book and of women lawyers will be held in the Atrium of the Edward Bennett Williams Law Library. The guest list is filling up fast, but there is still room for YOU, so get on board. I encourage all of you in the DC area to come—for a bunch of reasons, and here are just a few. First and foremost, you will be supporting women lawyers. One of my favorite quotes—and you have heard it from me before—is attributed to Madeleine Albright, former Secretary of State: “There is a special place in hell for women who don’t help other women.” Hear, hear. The more attention that we can create for the issues facing women lawyers today, the better the future for women lawyers will be. But, we have to stir things up a bit and get noticed. The Book Launch is a perfect time and place to do that, so come one, come all! Second, you will have an opportunity to network with lawyers from law firms and practice settings not only in the DC area but in other areas of the country. New York, Massachusetts, Florida and Michigan are a few of the other practice areas that will be represented among the attendees. The employment market for lawyers is still challenged, and you will be able to talk to those lawyers about the opportunities in a variety of geographic areas. This kind of networking does not come your way often, so take advantage of it. Think OCIs with good food, good drink and nice people! Some of those lawyers will be at the event representing the sponsoring law firms. These firms are AWESOME and have my complete admiration and heartfelt thanks for supporting the Best Friends at the Bar project now and in the past. Firms like DLA Piper, Womble, Venable, Cooley, Walsh Colucci, Polsinelli Shughart and Lerch Early have been there every step of the way. They provide financial support, and they are great cheerleaders for the project. Meet the lawyers from those firms and find out why they support women. Not all firms do, you know! You also will be able to meet some of the fantastic women who are profiled in the new book. Women like: Sally Blackmun, former in-house counsel, who might even tell you some tales of her famous Supreme Court Justice father; Kathleen Tighe, Inspector General of the US Department of Education and President Obama’s appointee as Chair of the Recovery, Accountability and Transparency Board; Markeisha Miner, Dean of Career Services, University of Detroit Mercy School of Law; Laura Oberbroeckling, Harvard Law Grad, who left Big Law to hang out her own shingle in style; and Amy Yeung, an outstanding entrepreneurial young woman, who also experienced Big Law and is now in-house counsel in a fast emerging and exciting industry. These women will inspire you, and you need to meet them. You also will meet Contributors to Book One, who jumped in when the project was in its infant stages and are completely devoted to the cause. They are not to be missed! AND, did I say that the food, the drink and the venue will be great! Yes, great, as in very tasty and plentiful food and drink and a killer venue. The Atrium of the Edward Bennett Williams Law Library at GT Law should be in Architectural Digest! Really! We are pulling out all the stops to celebrate five successful years of Best Friends at the Bar, and you need to get on the A-Train to join us. Here’s how you do that. E-mail my publicist at [email protected] and tell her that you want to come. It is that simple. She will take care of all the details. Be smart. Be there. I look forward to seeing Women Supporting Women! I have been a planner all my life. I make lists, cross out what I have accomplished, highlight in yellow what is really important, and rejoice when everything is crossed off the list—-until the next day when the list starts anew. I believe in planning ahead and being super organized, as anyone who has read the Best Friends at the Bar books knows. Throughout the time that I practiced law, I made a list at the end of each day and put it prominently on my desk to greet me the next morning. Over coffee, I reviewed the list, made priorities for the day and adjusted the list as needed. It was a good plan, and it worked for me. I had a personal relationship with my list. No one came between me and my list. But, recently, planning has taken on a whole new meaning for me. I now am planning my daughter’s wedding and a Book Launch Event at the same time. My fear—the thing that keeps me up at night and is not affected in the least by Ambien—is that I will end up with a book sales table at the wedding and a ring bearer at the book launch! You laugh… I am totally capable of that in my current state of mind. To boot, a man just came to my front door with a load of mulch that I know nothing about! A BIG load of mulch. The wedding is a way off and nothing can be done about the mulch man, but the Book Launch Event is right around the corner and you should know about it. 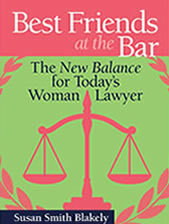 On September 27, 2012 from 6 to 8 PM, Georgetown Law will host an event to celebrate my new book, Best Friends at the Bar: The New Balance for Today’s Woman Lawyer (Wolters Kluwer Law & Business) that was released in July. The event partner is GlobalWIN (Global Women’s Innovation Network) and the event co-sponsors are Ms. JD and the following law firms to date: Polsinelli Shughart; Lerch Early; DLA Piper; Cooley; Womble Carlyle; and Walsh Colucci. As you might expect, I am both delighted and humbled by the enthusiasm for and participation in this event. I am particularly grateful to Georgetown Law for its generosity in hosting. We are expecting some special guests, and this is an event that you will not want to miss. The Book Launch Event is filling up fast, so get on board soon. If you did not get an invitation, please e-mail my publicist at [email protected] to have an invitation sent to you, and do not forget to RSVP per the instructions at the bottom of the invitation. If you have never been to the Atrium on the 5th Floor of the Edward Bennett Williams Library at Georgetown Law, you are in for a treat. It is a beautiful space, and I can tell you that there was nothing like it when I attended Georgetown Law. I remember a starkly simple single cube of a building that was know as Georgetown Law in my day. My class was one of the first with a high percentage of women, and finding a woman’s bathroom in those days was harder than passing Income Tax. The school could have raffled off “First In Line” passes to the women’s bathrooms and made a fortune! Hope you will join us on September 27th. 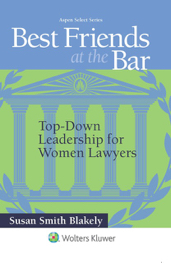 You will be in good company, and you will be supporting the mission of Best Friends at the Bar—-raising retention rates for women lawyers and increasing diversity in the profession. BTW, my plan for tomorrow is……………….oh, you really do not want to know!